As all of you mamas out there probably already know, the cravings have got to be one of the craziest parts of a pregnancy! You think you know your body and your palate—and maybe you’re even really good at eating healthy or sticking to a regimented diet—and then it all goes haywire! I’ve had some pretty crazy cravings so far… I just can’t get enough of those pancakes at Axe on Abbot Kinney. Oh, those pancakes! I’ve also been itching for an Umami Burger for days. The weird thing is that I’ve never even had one before! And then there was that time a few weeks ago when I was in the car and had the sudden urge to pull over and eat a steak—so I did. Plus, I’ve been consuming more Kraft Easy Mac than I had previously eaten in my entire lifetime and lots and lots of fruit—especially mango. Frozen yogurt is another big one. I thought I loved it before, but now I'd swear I've died and gone to heaven whenever I taste that brownie batter flavor from Yogurt Land. It can be pretty tempting to just give into all of the cravings, but I’ve been trying to keep in mind that doctors recommend you up your calorie count by 300 a day during a single baby pregnancy—which really isn’t that much. But now it’s Girl Scout cookie season, so you know how dangerous that is. Tagalongs are my absolute favorite! 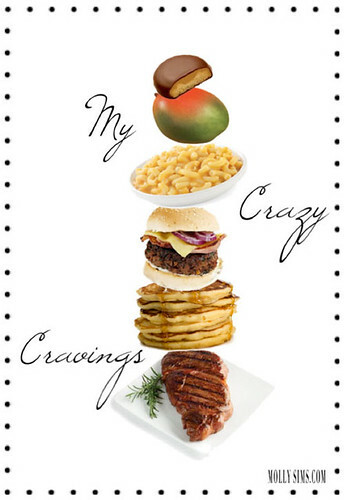 For all you mamas out there, what kinds of cravings did you have when you were pregnant?